The mantra Work Hard Travel Well was created in 2014 and initially used between myself and a few friends. The more I interacted on social media, the more I realized more people agree with the mantra in lifestyle. 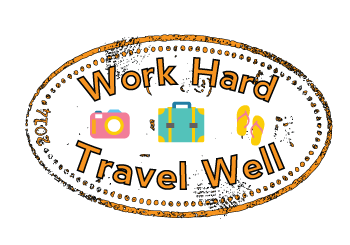 Now, Work Hard Travel Well is more than a hashtag, it is a travel resource and travel apparel company designed to help the busy professional see the world. Let’s take a look at some cool things that happened in 2018 with the Work Hard Travel Well Brand, #WorkHardTravelWell Travel Community and 13 travelers you need to follow for the new year! More designs and accessories were added to The Work Hard Travel Well store. The online store includes WHTW themed clothing, travel gear, and other cool travel tees! I hosted the first live #WorkHardTravelWell panel chat around solo travel. Watch the full video here. Sign up for the next one on Jan 29th here. I updated my phone and purchased a DLSR camera. This has allowed me to capture better photos and videos! Be sure to subscribe to the Work Hard Travel Well Youtube Channel. The Black Friday/Cyber Monday Portal was a hit. Here travelers could get direct access to flight, tour, and packaged trip discounts! Although those deals have expired get access to savings you can use all year long! Over 75K photos have been tagged with #WorkHardTravelWell on Instagram. The Work Hard Travel Well YouTube Channel hit over 20K views and over 300 subscribers! Make sure you subscribe to a view more travel tips and a look into hot destinations around the world will be covered on our YouTube Channel. Subscribe to keep up with live and helpful on-demand videos! I was invited and spoke on a travel panel hosted by Black and Abroad at the Gathering Spot in Atlanta! When one wins, we all win! Thanks @blackandabroad for sharing your travel hacks with us last night! Check out these dope creative travelers that exemplify #WorkHardTravelWell and FOLLOW them! What was your favorite trip in 2018? What are your travel goals for 2019? We have group couples’ trips planned throughout the year including Italy during the Summer. So I’m super excited about that. I planning for at least 6 trips for the year, not including work trips. How do you balance travel and your projects or business? Since I work from a home, it’s a little bit easier for me. I always make it clear to my clients and the people I work with, that I travel a lot. When I was working a corporate job, I wasn’t afraid to use my PTO. What is an important lesson you have you learned from your travels? Brandon is a Digital Marketing Freelancer and Creative Entrepreneur. A lot of my clients are music artists, so I work heavily in the music industry. As a Creative Entrepreneur, he has founded/co-founded several brands like The Great Couples. The Great Couples officially launched this month and it’s a community for couples who are intentionally dating, engaged, or married and wants to experience the world with the ones you love. What was your favorite trip in 2018 and why? Iceland by far! It’s the closest I’ve ever been to the north pole, which was pretty cool. Iceland feels like you’re right at the edge of the earth and there are so many unique and interesting land formations and drastically varying scenery that there’s no wonder so many shows and movies film here from time to time. What are your travel goals for 2019? I just want to continue having random adventures around the world with my wife. In 2019 we are planning on visiting Colorado, Japan, Korea, and somewhere in South America (all plans subject to change lol). I’m a VP at a large financial institution and I also own and operate 2 small businesses so my entire life is a balancing act! I do my best to stay organized and live my life by my calendar but the true secret to balancing it all is having a wife that is excellent with planning and time management! It’s possible to experience something different every day of your life. I balance both by always planning ahead, understanding and knowing when’s it works time and when’s its play time. Travel Is always a great investment, after each trip, you always come back with a deeper perspective on life. What was your favorite trip of 2018 and why? This month I went to Abidjan and Ghana. It was my first trip to Africa and I was blown away. It’s nothing like what the media tells you or anything like I imagined. It was incredible. The people were so friendly, the food was amazing, the experience was life-changing. Oh, and the turn up was so real. What are your travel goals for 2019? In January I’ll be going to South Africa for the first time. I’d like to get to another country or two before the end of the year, hopefully, that’s Japan. I’ve been dying to get there. I travel as much as I can. My firm recently gave me the ability to work remotely so I do that as much as possible to balance everything. Part of the reason I travel is to experience other cultures firsthand. I’ve learned that fundamentally, people are good and the same everywhere. I’ve also learned that being prepared is not always required but it helps. Noelle is an attorney who practices civil litigation. However, she loves to travel and wants to encourage other people to do so too, not because its the trendy thing to do, but because we need more well-rounded members of society. You cannot be totally well-rounded until you see how other people live and observe them in their daily lives. Travel helps to expand our narrow perception of reality. She created a blog a couple years back to give her perspective on travel and recount her experiences in her own unique way. She hopes that I’ve encouraged people to get out and see the world. What was your favorite trip of 2018 and why? Marrakech, Morocco it was my first time stepping foot in Africa. We went for my mother’s birthday and we had a great time exploring and stayed in a Riad with an amazing staff that really helped make the trip! What are your travel goals for 2019? I would like to travel more. I did less traveling this year, but they came with a lot of important memories and milestones. Do things when I have time. Explore my own hometown of NYC and surrounding areas. I’ve learned to not have any expectations. Go with the flow. Holly blogs about travel, food, and also vlogs her adventures. She is starting to work on a new series about weddings all over the world. What was your favorite trip of 2018 and why? My favorite trip was easily my trip to Sri Lanka. Sri Lanka was everything a country should be. It had so much untapped nature so you get to see the country in its natural beauty. It’s not a huge tourist destination yet so you still get to feel the local sense and not the hustle and bustle you get in many touristy places. There were mountains, beaches, cliffs, waterfalls, tea plantations and a lot of greenery there. I went with low expectations and they were exceeded tremendously. I think that’s what I enjoyed so much, I was in an unexpected state of awe with just how amazing Sri Lanka was. What are your travel goals for 2019? My travel goals for this year are to get to South America and Africa which I will accomplish this summer. I’d also like to go to more places off the main path. I’ve found that I’ve outgrown traveling to big cities and I’ve turned into more of an Island guy. I love the beach, so I enjoy going anywhere with water. My only travel goal for 2019 would be to get more of my friends abroad and to watch my business expand. As a teacher, I’m given a lot of downtime. So traveling isn’t really difficult for me to do. Also, living in Asia makes it easy for me to move around a lot because flights and accommodations are pretty inexpensive. However, I’m always working with The Roaming Republic. Luckily with this company, I can work from my phone or my laptop so balancing my projects, business and traveling aren’t too difficult. I try to do a good job of not overworking myself and definitely taking me days. An important lesson I’ve learned through my travels is just how strong and independent I am. I’ve been living abroad for 2 1/2 years at this point. Growing up I was very much a homebody/mama’s boy. It still surprises me that I was brave enough to take the leap of faith and live abroad. My travels and experiences have opened my mind up and allowed me to grow as a man. I’ve learned how to deal with people from many walks of life, as well as being more open-minded to other’s lifestyles. Traveling has definitely made me a much better person. Cedric is a teacher working with adults in Malaysia. Outside of that, he is the owner of a luxury travel company called The Roaming Republic. We curate luxury group trips with people all over the world without breaking the bank. I also have my own scholarship in which I help African American students study abroad. You can find more information about the trips on and about my scholarships via Instagram. What was your favorite trip of 2018 and why? Omg! That’s such a hard question! For now, I would have to say my favorite trip was my most recent which was Thailand! Visiting Asia has been on my list for years and it was such an accomplishment for me to pull through on my big list of places to travel to. Thailand has such a beautiful spirit and I was so in love it. From the temples and street food of Bangkok to the serene yet lit waters of Phuket, I had an experience of a lifetime. What are your travel goals for 2019? I am in the process of creating my list of places I would love to visit in the year 2019 but I know for sure that I want to see Machu Picchu and make my way further into South America! Traveling has become a method of self-care in the last couple of years for me. I treat it like I would any other self-care method. I make it a priority in my life and I try my best not to sacrifice what I love, plus having multiple breaks throughout the year makes it a tad bit easier. This year it would be ” It’s okay to relax”. This may seem odd to some because when you think about travel in most cases, it’s to relax right? For me, that wasn’t the case. I wanted my trip to be jam-packed with loads of things to do so I could maximize my time effectively. I realized that travel burnout is a thing and that is is just fine to not have any plans on a travel day. It is completely okay to just chill and not have an itinerary for everything! Tyler is an educator in all aspects of the word. She teaches 3rd grade in all subjects as well as educates adults on affordable travel through in-person workshops and upcoming travel-related online courses. In the upcoming months, she will have projects dedicated to raising awareness of study abroad opportunities for college students of color as well as bringing together black and brown travelers for meet-ups in the city of Los Angeles. Morocco because it was amazing to see such a vibrant culture. What are your travel goals for 2019? I definitely have my sights set on Thailand this year. I’m also planning to focus more on South America and Africa this year. The Amalfi Coast has been on my list for quite some time as well. My client management software helps me stay on track with work while on the go. The software comes with an app that allows me to keep track of all my ongoing projects, end emails, respond to inquiries, create workflows, send contracts/invoices and more all from my mobile device. I’ve also learned to schedule time for work and time for play AND I’ve learned not to feel guilty about it. I’ve always been a firm believer that if you can give your all to something or someone else you can most certainly do so for your own self. You know the saying “you can serve from an empty vessel.” That means making sure you’re taken care of so you can continue doing so for others and YES that includes whatever you need to include such as travel, sleep, spa date, personal Netflix and chill time…whatever it may be. There’s truth to the phrase: LIVE, WORK, PLAY. That’s why I love the hashtag #workhardtravelwell because there’s definitely an opportunity to do both if you choose. I’ve learned it doesn’t take much to be happy in life. I’ve seen some of the happiest individuals with much less than I ever thought I could go without. I’ve learned inner peace and a positive mindset can change your whole world and how you see yourself living in it. Tash works as a child and family photographer. My favorite trip had to be going to Barbados for Crop Over which is their version of carnival. The atmosphere during the 4 days was crazy. It was such a vibe! Will definitely be doing another carnival in the Caribbean in 2019. What are your travel goals for 2019? In 2019, my biggest travel goal is to get to a country in Africa. I know traveling to a country where everyone looks like me, will be so comforting. Being freelance, its easier for me than most because I make my own schedule. Before I became freelance I was fortunate to work for a company who supported your passions outside of work. They knew travel was a real thing for me and would help figure out ways to get me time to go travel. Being flexible and adaptable. Situations don’t always go to plan when you are traveling. There will almost always a hiccup along the way. You just have to be open to change and not let things bother you when and if they do change. Justin is a freelance filmmaker and photographer in LA. In 2019, his goal is to combine what he does for work and travel to make more video travel guides of countries he’s visited. Manual Antonio, Costa Rica is a true Travel Gem! It’s inexpensive, safe, and the food was great! Even though it is about three hours from the San Jose Airport, it was well worth it. I am a Traveler who prefers a local experience so this trip was a great fit for myself and my Travel Crew. I was able to coordinate an amazing community service project at the Sábalo School which is located on Costa Rica’s Central Pacific Coast about 30 minutes outside the town of Quepos in the Puntarenas Province. What are your travel goals for 2019? Bali and I will also be attending East African Yacht Week in June, and Anguilla in November. Who knows what other trips will pop up as well! I think when you are passionate enough about something you find the balance. Entrepreneurship is NOT easy. There are a lot of late nights and early mornings and of course when duty calls (as I mentioned I’m in the Air Force), so that is always a priority. Planning is key. Leaning on the people who believe in you the most and are willing to help where they can is very important as well. Patience! Especially when you are traveling all over the world, you have to realize that everyone’s customs and courtesies are different. Also to pack a mean carry on bag because you never know if your checked luggage will make it on time to your final destination. LaShonda is the Founder of PassportsMatter LLC. Their motto is to Travel, Serve, and Inspire. At the Sábalo School they completed a Vision Board Project that inspired the kids to set future goals and to ‘think outside the box.’ They also donated school supplies and continued the day with a short soccer tournament, and lunch! As a Service Member in the Air National Guard (USAF), LaShonda knows first hand how important it is to build trusting relationships around the world. What was your favorite trip of 2018 and Why? A solo trip to India was my favorite. For a few short months, I lost my inspiration to create content. Visiting India and seeing the beautiful architecture while being treated so nicely by the people is exactly what I needed to be inspired to create Again. Due to the inspiration I received in India, I was able to create my best content thus far. What are your travel goals for 2019? Travel goals this year are to visit more countries and partner with more brands. Bucket list trip this year is a trip to Zambia to visit the beautiful Victoria Falls. How do you balance travel and your projects or business? Aside from being a travel blogger, I’m also a risk analyst at a top tier investment bank. I am given ample vacation time. I find my balance by traveling once every 2-3 months. During the time I am not traveling, I am creating content, taking web courses and doing other things to grow my brand as well as plan my next destination. As a woman traveling mainly solo, I learned that the majority of people are good regardless of what the media puts out there. There are negative people sprinkled all the world and not just in 1 particular place but most are good. Devorah operates a travel blog dedicated to self-growth through experiencing the world. Her next project is in December where she will collaborate with 2 hotels in Switzerland to document how to best see the country for a short time. She will document how important it is to have that time with your best friends to encourage women bonding. What was your favorite trip of 2018 and Why? My favorite trip in 2018 was when I traveled to Havana, Cuba. I went with my dad to visit his family. It was awesome to see his old house and it was also cool to see how the locals live. It was a humbling experience that I will never forget. What are your travel goals for 2019? My travel goals for 2019 are Bahamas, Cusco, Maldives, New York, Ohio, and anywhere in Africa. How do you balance travel and your projects or business? I try to give work and travel as much attention as possible because they both go hand in hand. So I just incorporate the two together. They’re equally important to me. Dro works for a cruise line and is in the process of putting together my a group trip. What was your favorite trip of 2018 and Why? Barcelona. Over 10 years ago, I thought about double majoring in College in Spanish. The thought of studying abroad and going to Spain seemed like something that may not happen or that my mom could not afford. Fast forward to 2018, I visited Barcelona and my mom joined for her first passport stamp. What are your travel goals for 2019? Paris and London are up first and booked. I am interested in visiting South Africa and Portugal. Somehow I would love to work in Argentina or Australia but need about 2 weeks in each. How do you balance travel and your projects or business? I always make time for it and be sure to have leisure time and not always be stuck in blogger mode while on vacation. Don’t let fear take away from your desire to see the world. Kim is a sales account manager by day and a travel content creator in between. Be sure to connect and follow all of these travelers. What do you like most about Work Hard Travel Well? Where will you go this year? Comment below! Click To Read Previous Travelers To Know Articles!